The start of today’s German Grand Prix was a bit unusual to say the least, the changeable weather meaning last minute decisions needed to be made. A brief downpour just before the MotoGP race was set to kick off saw most riders start the race on wet tyres, only for most of them to return to the pits after the formation lap when they realised the circuit was drying more quickly than they had expected. Jumping on their dry bikes and making their way to pit lane was a bizarre way to start a GP to say the least. Stefan Bradl decided not to play follow the leader and his decision to start his home race on slick tyres was a good one. He was one of only nine riders to start from the grid itself and the only one on slicks, getting a decent headstart on the others chasing from pit lane. Factory Honda riders Dani Pedrosa and Marc Marquez didn’t take long to chase the German down, catching him by lap six. It turned into a two horse race with both Spaniards passing Bradl with ease and leaving the rest of pack behind with ten laps to go. The result from there was as predictable as ever, Marquez putting on a show of strength that Pedrosa had no answer for, eventually taking the win by 1.466 seconds. It marked his ninth victory this season and of course maintained his 100% record winning run. Further down the field Jorge Lorenzo was putting in a resurgent display which saw him finish the race on the final podium position. Rossi, Iannone and Aleix Espargaro were left to battle for the remaining positions, The Doctor claiming fourth with Iannone fifth and Espargaro following in sixth. The race finished with some drama for Cal Crutchlow who had been battling his Ducati team mate in the later stages. Tech 3 Yamaha rider Pol Espargaro joined the scrap and passed both Ducatis in the final stages. Crutchlow lost out and eventually let Alvaro Bautista through, coming home in tenth. It was a disastrous home Grand Prix for Bradl in the end, going backwards from the lead to eventually finish in a dismal 16th place. 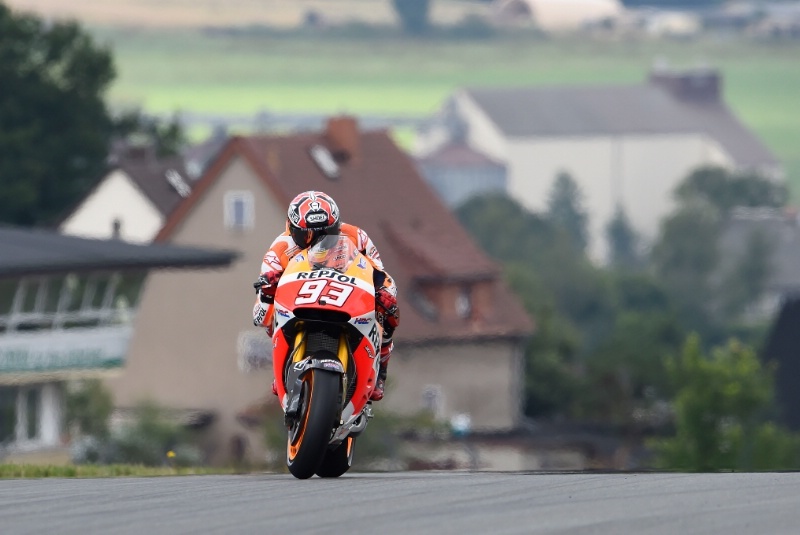 Sachsenring marks the end of the first half of the season, returning after a break to Indianapolis on August 8th.